For Mary, the mother of Jesus, that day was anything but good. Just days before, the crowds gathered on the streets to adore her son. But on the darkest day, the crowds turned on Him. The shouting this time came with out praise. They traded palm fronds for spitting. The guards cruelly beat Him, tore His clothes and laughed as the blood drained from His broken body, draining Him of the life He came to earth to give. He only ever spoke words of life and of love and of peace. Their actions were death and animosity and hate. As Mary sat at the foot of the cross, her beautiful son, beaten and dying in front of her. The angry, jeering mob behind her and only John by her side. The lonely, anguish filled moment must have ravaged her soul. Her weeping filled the ears of those nearby as the world turned so quickly on that horrendous day. Even knowing what Jesus taught, there is no way she could have expected that some day, this would be known as “Good Friday”. What Christ gave that day, what Mary witnessed and lived that weekend was not the end. That is what made it good. The price paid for our eternal destiny was higher than anything ever given to us. His life in exchange for ours. His love poured out on a hill to save humanity. Still, in all the horror, He looked down to His mother, to His beloved disciple and gave them hope. At that moment He declared them family. 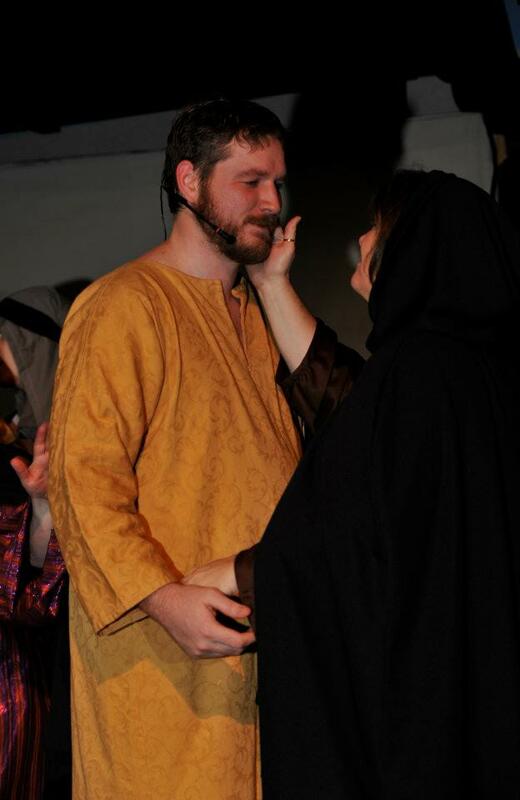 For two years I portrayed Mary in a local production of “The Passover Lamb”. At the first rehearsal of the bloody scene, my director took me aside and gave me a picture of the portrayal she imagined. The scream of a mother, the gut wrenching horror of what she would see in front of her. Anyone with a thread of humanity would find the scene painful but a mother would not be able to contain herself. There was no gently weeping, no Hollywood characterization of the role. There was only raw, unfiltered emotion. From sitting at the foot of the cross to the hollow, drained aftermath all the way through the elation of resurrection day. Woven through every moment was the thread of disbelief. The shock that turned to mourning and ended in jubilation. As a parent I’ve had my share of painful moments and grief but nothing compares to the holy days Mary walked through. The woman who, as a young girl, was chosen to carry God’s Son also raised Him to adulthood. She followed Him with the disciples. No doubt she befriended the women who were healed by Her Son. Maybe she mentored them too. Most importantly, she was there, at the foot of the Cross. Mourning, weeping, losing her Son to a dying world. Although she might have questioned, she never lost faith. Three days later, in the still of the morning, followers found His grave empty. So Today, on this Good Friday, I will reflect on the life given for me to have life. I’ll remember the mother whose cries of pure sorrow were replaced by joyful tears as she witnessed His return. I don’t know firsthand the grief Mary went through. It’s beyond my imagination. What I do know is the victory that the resurrection has poured into my soul. Following Him has been the single most important decision of my life.